Ritz Carlton Montego Bay situated on a wide stretch of white-sand beach overlooking shimmering beautiful waters and lush green mountains as backdrop to offer you. With an unprecedented reputation of luxurious accommodations and service this Jamaican flavored golf and spa resort offers an idyllic escape filled with rhythmic sounds of reggae and an amazing set of attractions. This montego bay Jamaica beachfront resort has 427 rooms and suites, each with their own private balcony or patios, including a full service spa. From the time you arrive to when you leave, the service that you'll receive at this resort will have you purring and your stress melting away. 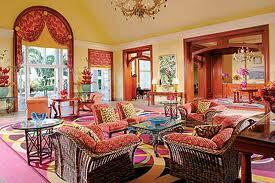 Here is something you are going to love, and one of the best features of this hotel to me. After traveling to get to Jamaica, clearing Immigration and Customs at the Montego Bay Airport you then walk over to the Welcoming Center of the Ritz Carlton Montego Bay, where they check you into the hotel right there at the airport. You receive your room number, keys and your luggage is transported to your hotel room. Then you are driven in a black Lincoln Towncar to the hotel, which is less than half a hour away, without a care in the world... you have definitely started your vacation. You are now ready to enjoy all that the Ritz Carlton has to offer. The attractions at the Ritz Carlton Montego Bay include the warm white secluded beach, a dolphin program, a golf course, fine dining, gym and spa, to name a few. You'll find organized daily activities that includes water sports, tennis for adults and 'Kid Camp' for little kids and 'Kids Night Out' for young kids. Of course you can do your own thing and lay out on the beach getting your tan on, swim or just relax enjoying your drink and some great jerk chicken and reggae music right there on the beach. Undoubtedly the best thing about the Ritz Carlton Montego Bay is its famous championship standard 5,000 acres golf course located at the Rose Hall Plantation. Where you'll find the best Caddies in the world. If you are a beginner they'll instruct and guide you on the best shots. By the end of your golf day, you'll say I am the best. 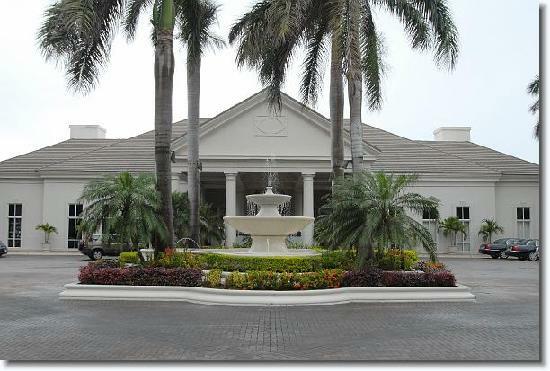 The 18-hole White Witch Golf Course is located only ten minutes away from the Ritz Carlton Montego Bay resort. 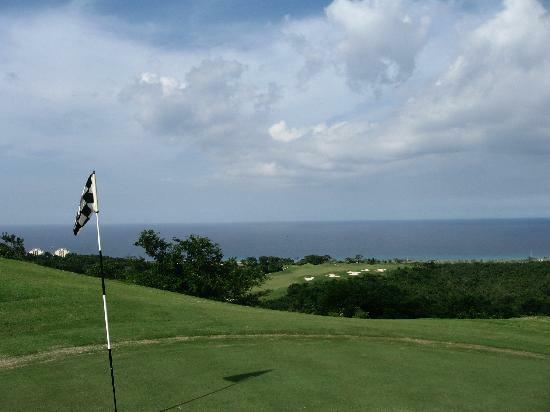 This golf course is considered to be one of the finest and challenging golf course in the Caribbean, and offers a panoramic view of the gleaming Caribbean Sea from the 16th to the 18th holes. This par-71 golf course is 6,859 yards of fun, cool trade winds and a challenging mountainous terrain. You do not have to be a guest at the Ritz Carlton or Rose Hall Plantation to play here. At an additional cost to the standard rate anyone can play golf at the White Witch Golf Course. Another 18-hole golf course is nearby at the Half Moon Resort, but I am told it is not as challenging. You will be impressed by the cuisine served at this five star hotel. The dining here is exquisite and a life-time experience at the following five specialty restaurants. Jasmine - Small intimate Asian-style restaurant with the tables illuminated by flickering candlelight that sets the mood for a romantic dining. Horizon - Offers amazing Mediterranean inspired dining with a special menu for kids and a la carte breakfast menu with both, an indoor and outdoor sitting areas. 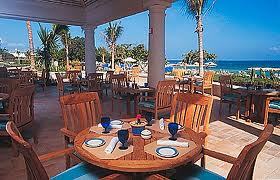 Mangos - A beautiful oceanfront restaurant with live Jamaican music, food and drinks. White Witch - Located at the White Witch Golf Course. This casually set restaurant offers exotic view of the Caribbean sea along with sunset cocktails. Reggae Jerk Center - Rich with live reggae music and menus offering true Jamaican cuisine on the West Beach of the Ritz Carlton Resort. Cohoba Lounge - Best cocktails round the clock with live entertainment, complimentary drinks and rich tasty food. The food served at these restaurants is rich with traditional Jamaican flavors and a good serving size. All in all complimenting your stay at the Ritz Carlton. Upon arriving at the Ritz Carlton's lobby, you'll again realize that you have chosen the perfect hotel to enjoy your vacation. Be it service, food, luxury, attractions or the beautiful scenery, the Ritz Carlton Montego Bay has nothing but the best to offer you, it's guest. Whether you prefer to lay back and sunbathe in the Jamaican sunlight or participate in adventure and sports, a stay at this resort will turn your vacation into an experience you will always remember.